Definition at line 30 of file LogEventsList.php. The first two parameters used to be $skin and $out, but now only a context is needed, that's why there's a second unused parameter. IContextSource | Skin $context Context to use; formerly it was a Skin object. Use of Skin is deprecated. int $flags Can be a combination of self::NO_ACTION_LINK, self::NO_EXTRA_USER_LINKS or self::USE_CHECKBOXES. Definition at line 67 of file LogEventsList.php. References ContextSource\$context, $flags, $linkRenderer, ContextSource\getUser(), ContextSource\setContext(), and ChangeTags\showTagEditingUI(). Definition at line 372 of file LogEventsList.php. Definition at line 379 of file LogEventsList.php. Drop down menu for selection of actions that can be used to filter the log. Definition at line 341 of file LogEventsList.php. References $value, as, and ContextSource\msg(). Definition at line 223 of file LogEventsList.php. string|bool String on success, false on failure. Definition at line 764 of file LogEventsList.php. References $user, $wgLogRestrictions, as, and null. Referenced by WikiExporter\dumpLogs(), ApiQueryLogEvents\execute(), ApiQueryLogEvents\getCacheMode(), and LogPager\limitType(). Definition at line 313 of file LogEventsList.php. References $formDescriptor, $input, and Hooks\run(). Definition at line 199 of file LogEventsList.php. References $filter, $options, $type, as, ContextSource\msg(), and text. Definition at line 86 of file LogEventsList.php. Definition at line 444 of file LogEventsList.php. References $query, $user, Xml\check(), LogPage\DELETED_RESTRICTED, SpecialPage\getTitleFor(), ContextSource\getUser(), Linker\revDeleteLink(), and Linker\revDeleteLinkDisabled(). Definition at line 288 of file LogEventsList.php. Definition at line 301 of file LogEventsList.php. Definition at line 242 of file LogEventsList.php. References $type, as, ContextSource\getUser(), and LogPage\validTypes(). Definition at line 275 of file LogEventsList.php. Definition at line 577 of file LogEventsList.php. Referenced by ApiQueryLogEvents\extractRowInfo(), ProtectedPagesPager\formatValue(), ChangeTagsLogItem\getHTML(), and RevDelLogItem\getHTML(). Definition at line 387 of file LogEventsList.php. References $attribs, $ret, $revert, $time, class, ChangeTags\formatSummaryRow(), ContextSource\getContext(), ContextSource\getLanguage(), getLinkRenderer(), getShowHideLinks(), ContextSource\getUser(), list, LogFormatter\newFromEntry(), DatabaseLogEntry\newFromRow(), Html\rawElement(), and Hooks\run(). 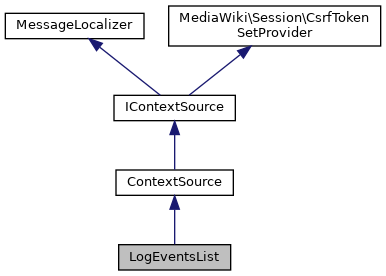 Sets the action types allowed for log filtering To one action type may correspond several log_actions. Definition at line 365 of file LogEventsList.php. wrap String Wrap the message in html (usually something like "<div ...>$1</div>"). Definition at line 606 of file LogEventsList.php. References $args, ContextSource\$context, $flags, $lang, $out, $s, $user, array(), DB_MASTER, div, IContextSource\getLanguage(), RequestContext\getMain(), IContextSource\getOutput(), link, message, MessageLocalizer\msg(), Xml\openElement(), Html\rawElement(), Hooks\run(), type, and wfGetDB(). Referenced by EditPage\addPageProtectionWarningHeaders(), Article\confirmDelete(), SpecialContributions\contributionsSub(), Article\delete(), Article\doDelete(), SpecialEditTags\execute(), SpecialRevisionDelete\execute(), DeletedContributionsPage\getSubTitle(), SpecialUpload\getUploadForm(), HistoryAction\onView(), ImagePage\openShowImage(), SpecialChangeContentModel\postText(), SpecialBlock\postText(), MovePageForm\showForm(), SpecialMergeHistory\showHistory(), SpecialUndelete\showHistory(), EditPage\showIntro(), FileDeleteForm\showLogEntries(), ProtectionForm\showLogExtract(), SpecialPageLanguage\showLogFragment(), MovePageForm\showLogFragment(), UserrightsPage\showLogFragment(), and Article\showMissingArticle(). Show options for the log list. int | string $year Use 0 to start with no year preselected. int | string $month A month in the 1..12 range. Use 0 to start with no month preselected. int | string $day A day in the 1..31 range. Use 0 to start with no month preselected. Definition at line 110 of file LogEventsList.php. References ContextSource\$context, $filter, $formDescriptor, $user, array(), HTMLForm\factory(), getActionSelectorDesc(), ContextSource\getConfig(), ContextSource\getContext(), getExtraInputsDesc(), getFiltersDesc(), SpecialPage\getTitleFor(), getTitleInputDesc(), getTitlePatternDesc(), getTypeMenuDesc(), getUserInputDesc(), ContextSource\msg(), null, Html\rawElement(), text, and wfDeprecated(). Definition at line 517 of file LogEventsList.php. Determine if the current user is allowed to view a particular field of this log row, if it's marked as deleted. Definition at line 541 of file LogEventsList.php. Referenced by RevDelLogItem\canView(), ChangeTagsLogItem\canView(), ApiQueryLogEvents\extractRowInfo(), and RevDelLogItem\getApiData(). Definition at line 554 of file LogEventsList.php. References $user, LogPage\DELETED_RESTRICTED, null, and wfDebug(). Referenced by LogFormatter\canView(), ApiQueryWatchlist\extractOutputData(), ApiQueryRecentChanges\extractRowInfo(), ProtectedPagesPager\formatValue(), and ChangesList\userCan(). Definition at line 50 of file LogEventsList.php. Definition at line 35 of file LogEventsList.php. Referenced by __construct(), and showLogExtract(). Definition at line 55 of file LogEventsList.php. Referenced by __construct(), and getLinkRenderer(). Definition at line 40 of file LogEventsList.php. Definition at line 45 of file LogEventsList.php. Definition at line 31 of file LogEventsList.php. Definition at line 32 of file LogEventsList.php. Definition at line 33 of file LogEventsList.php.